Are mornings one of the worst times of all for you as a divorced woman? Do you pull the covers over your head and can't bear the thought of facing another day? Do you feel that you just need quiet undisturbed time to process what's going on in your life and have time to comfort yourself, and instead you're trapped on a hamster wheel of obligations, career, and thoughts about your ex? Not to mention the inner obligation that you feel inside in terms of how you're allowed to act and feel. One of my beliefs -- proven over and over by so many clients -- is that you can greatly accelerate your emotional healing by taking small steps of self comfort that will allow you to begin to see the value you truly have. The importance of how you see and value yourself is ultimately much more important the opinions of others in your life. Even though it doesn't feel like it right now. I remember I felt I'd been down so long I couldn't even remember the last time I'd felt great or even good. Marriage had been cutting me down to size for years at that point. From the outside, friends said that it was incredible how well I was handling my ex's betrayal, all the secrets that kept being revealed by the other woman as if my ex's hidden life was being pumped into my veins by intravenous drip . . . but, on the outside I was cool and sarcastic, making fun of it all. But it didn't feel that way when no one else was around. Let's take back control of those early-morning moments when you have to wake up (like it or not), and let's make them something that adds to your happiness, and gives you the most empowering and encouraging start to the day. Morning truly does set the pattern for your day, and a stressful or rushed morning takes time to overcome -- so let’s not have any ugh! oh noooooo! morning scenarios that make you want to pack the day in before you even start. Unlike other Miracle Morning schemes you may have seen, I'm not going to suggest you wake up earlier. My clients are already exhausted, and often aren't sleeping through the night, so this is more about using the time you have in a self-nurturing way, not about putting yourself through some kind of high-powered productivity bootcamp. This is all about using those first few minutes (when you're awake but can't bear to start your day yet), in a way that makes you feel hopeful about today. Let's find a way to make that quiet time really delicious for you, so that you will look forward to it, instead of waking up to, "Yeah. I'm still here. My life is still in the garbage." 1. Get everyone on board. If you don't live alone, let the others in your life know that you need a little quiet time first thing in the morning, and set some boundaries, if you need to. Mom Cave sign, ready for laminating and posting to your bedroom door as part of our rock-your-morning freebie package (see the sign-up box above). For example, If others in your life are disrupting your quiet time while your bedroom door is closed, you may want to put a sign on your bedroom door indicating whether or not you're ready for interruptions yet. For more on this, if you have kids at home, don't miss step 3. 2. Turn your bedroom into a luxury spa experience. What can make your bedroom atmosphere feel more like you're on a luxurious vacation? How about moving your coffee maker into your bedroom, and putting a little mini fridge in there too, so that your morning coffee and cream are no more than a few steps away? Or maybe tea is your beverage of choice. Whatever it is, you can have it set up the night before, and enjoy it before you ever leave your bedroom door and greet the others in your space. Have a few items on your bedside table that help you reconnect to the person of infinite possibilities who lives inside you, and wants to have the chance to breathe and be herself during this day. You might have a favorite invigorating scent, read a few pages of a favorite inspiring book, pick a card from a favorite oracle deck to inspire your day. Or maybe something you feel is a little silly, like a stuffed animal . . . or anything comforting that you sit quietly with for those first few minutes of the day. Just a way to center yourself: a beautiful and inspiring focus to your thoughts. A way to remind yourself that "THIS is the way I want to feel today." It's a mini spa for you. A way to experience those small luxuries as if you are at a 4-star hotel. A way to open your eyes in the morning and feel excited about those first 15 minutes. Have a sheet mask on your nightstand and refresh your face while you have your coffee or do a little inspirational reading. Prefer a quieter start to your day? I love listening to positive affirmations first thing in the morning, and you can find something that appeals to you if you search "morning affirmations" on youtube. Have someone who pesters you on the phone first thing in the morning? Try leaving your phone far away from your bed on silent the night before, so that your phone can’t disturb you for these essential first 15 minutes of your day. Get my freebie, above, for a printable to help you figure out what you want your wake-up to be like (plus you get the Mom Cave sign). 3. Kids at home? Night-before prep sets you up for a luxurious morning. Anything that makes mornings more stress-free for your kids, makes mornings more stress-free for you. All lunches and backpacks packed the night before. Breakfast laid out the night before so the kids can grab breakfast while you're calmly getting your mind and emotions as close to where you want them to be as you can. Morning quiet time: Earbuds on (no loud devices) and no TV before a certain time of morning, if that's something that would make a huge positive impact on your day. 4. Wake up, give yourself a hug, and set your intention for the day. 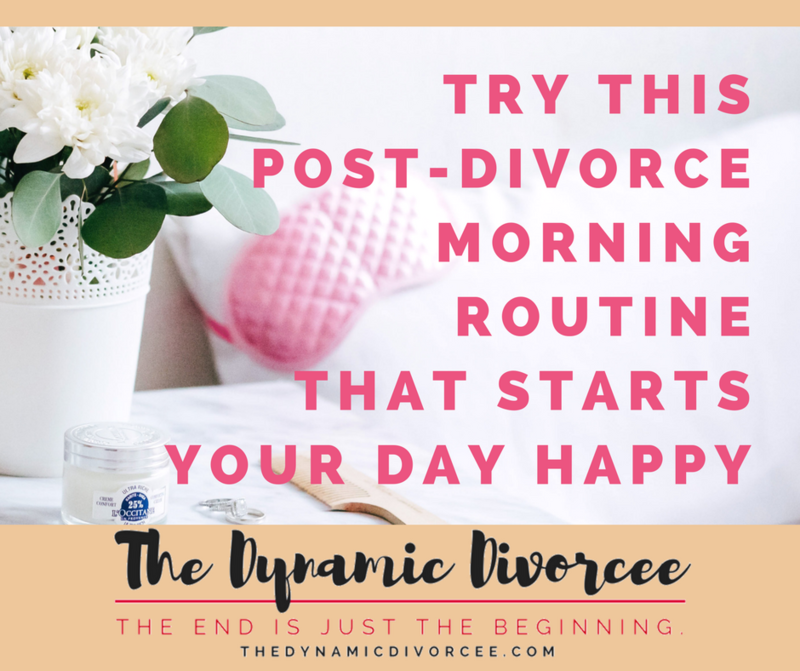 You've set everything in place the night before, and now it's time to test-drive your Happy Divorcée Morning Routine. As you enjoy your in-room morning beverage, relax for a few more moments in bed, take some relaxing deep breaths, and in these quiet moments, visualize how you want your day to proceed. If you anticipate some rough spots, see yourself handling them with ease and any difficulties evaporating away. You can be thinking these centering thoughts and blessing yourself with positive visualizations at the same time that you're showering yourself with love using some of the "spa" suggestions you set up in step 2 the night before. 5. At around 10 this morning, take a moment to check in with how you're feeling. Did your new morning routine help (even just a little bit)? Small gains are incredibly important when healing from divorce, and these gains can be built upon a little more every day. If you've been following this series of posts, these practices are always there for you to fall back on when something unexpectedly negative happens, when your ex has a fit, or when you have a setback of any kind. You can use any of the practices I've been sharing (tiny infusions of joy, bedtime ritual, or happy morning routine) to help you re-center yourself and find peace in the midst of the whirlwind. Life may be pushing you around, but why do the same thing to yourself? Challenging and emotionally devastating times of life such as the divorce process and the months and years following divorce call for special measures to take back your life. To recreate your life in a way that has strong positive meaning for you. And because this is a time that can carry with it so much sadness, and such a big hit to self-esteem and your sense of who you are, this self-creation process has to be soft and comforting rather than bootcampy in its nature. As always, I would love to hear your experiences with mornings and these divorce life hacks.